(Netherlands, so Amaranthus would be in the same one as us... what was that... GMT +1?). Dutch Nick doesn't have the same broadcasting times as Belgian Nick. Also, watching online uses a lot of bandwidth, and I just prefer television. I'm glad I'll be able to see season 3. But I just want it to go to a regular timeslot instead of them airing it between repeats of season 2. They never did that with season 2. Why do it now? 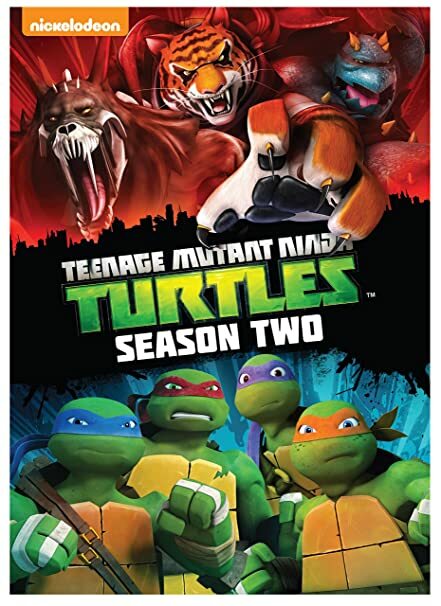 Anyone know of a release date for a DVD box set of Season 2? Well, I watched the first episode of season 3 today. I didn't like it, to be honest. I hope I'll be able to see the non-filler episodes soon. Fix that f*cking timeslot. They're not even promoting new episodes like they did with season 2. Well, my point was more that we were in the same timezone for when the downloads show up, not that the scheduling would be the same. I have a weird question. Okay, so considering how the mutations go (that you turn into the last thing you made contact with) well... So since Yoshi bought the turtles, I'm assuming he handled them as well and that's how they became turtle humanoids... So if that's the case then maybe it's appropriate that Splinter calls them his "sons". Perhaps they are an extension of his self. Last edited by evan2000; 03-18-2015 at 02:02 AM. ^^ This part always confuses me. Why exactly are they so weirded out? Because he used a Kraang droid's arm to block the door? Is that all? That doesn't seem entirely odd to me...at least, not worth being stared down and called "seriously twisted." Is there some other joke going over my head here, or is that all there is to it? Nick only got away with this because the Kranngdroid is a "robot" and not an actual human. Yeah, I guess. But since it's a robot we're dealing with, it doesn't seem all that weird to me, I dunno. I just feel like their response was a little dramatic, is all. He did what he had to. It confuses me that Raph says <<Thanks>>. "The enemy of my enemy is my bro!" It's definitely not a weird question - it's something I've wondered myself and I know there's been a lot of debate about it, both here and on other sites. Yoshi may have handled the turtles before their mutation... or maybe they were handled by pet-store employees who put them into the bowl before they were sold to Yoshi. I don't think there's a definite answer on this - IMO, Splinter regarding them as his sons is based on him raising them and loving them and caring for them like a father would... not necessarily just because they have his genetic material. I'm thinking maybe Leo and Karai's relationship will play out as more of a Luke/Leia thing - initially there's an attraction and some flirting but eventually it settles more into a brother/sister dynamic. Leo clearly doesn't see her as a sister. In Serpent Hunt when Mikey told Karai he's her brother, Leo specifically said "friend". Besides, at the last comic con when Kelly Hu was there, Ciro mentioned that Leo had a crush on Karai still and that was after Vengeance is Mine aired. Thanks for your answers, guys! I wasn't sure if Leo was still crushing on Karai or not. I suppose that might be hard for him to do now that she is a mutant losing her humanity bit by bit. But there's no doubt he cares about her. I didn't consider the pet-store employees handling them! That's a good conjecture. Makes sense. Do you guys remember the episode where Mikey is humming the '87 theme song? Yeah, I think it was the 87 theme he was humming in "I think his name was Baxter Stockman". Yes, the part when the turtles met Baxter Stockman for the first time, they were about to attack him and Mikey asked everyone to WAIT because he need to keep his T-pod, he was humming the tune as he was doing it. Does Tiger Claw end his sentances with "Nya" in the Japanese dub?